With a name suggested by long-time associate Steve Barker, and a legend that says that the music contained within almost broke the limiters on the disc-cutter, Missing Brazilians` “Warzone” is out there even by ON-U standards. The players on the session included Nick Plytas, Bonjo Iyabinghi Noah, Martin Frederix, Bembo Creary, Eskimo Fox, Evar Wellington, the singers, Shara Nelson & Annie Anxiety. All ON-U regulars but this record is really a product of Adrian Sherwood & Kishi Yamamoto`s sonic experimentation in Southern and Berry Studios. Sherwood working under the aliases of “Crocodile” and “Prisoner” creating rhythms and bass lines, punching in drum machines to form a fractured Funk. Electrical drills and fireworks buzz and scream. Animals roar. Little Annie`s dark poetry is set against a backing of ballistics and ricochet, sub-bass distortion. Broken piano rattles like a beaten mouth, timbres are disintegrated by delay. Dodgy contacts make blasts of noise like overdriven doorbells. Cats are strangled. African Jazz meets Shangaan Electro. Organs get ground, emitting stringent, phased, blocks of chords. Balls of mercury bounce in tin cans. Percussion is tuned like a zither then shaken apart. When the kick falls away, the debris is left to the mercy of zero gravity. Sound shredded, coated, drugged. 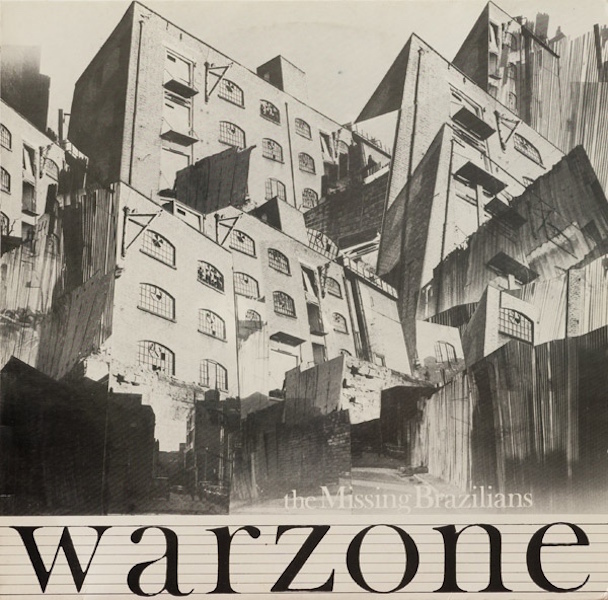 Missing Brazilians` “Warzone” was reissued by ON-U Sound last Friday. You can order directly here.